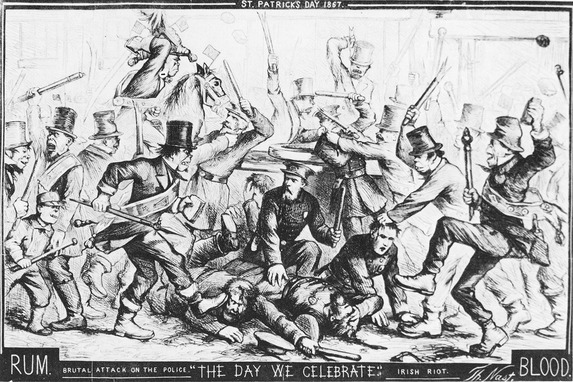 This cartoon by Thomas Nast depicts a riot that took place on March 17, 1867 in New York City between Irish immigrants and the Metropoliton Police. Just two years after the New York City draft riots, violence related to politics remained a feature of city life and often broke out on election day as well. Irish immigrants overwhelmingly supported the Democratic Party. Nast decried the violence and believed that Irish immigrants were corrupting American politics. Brutal Attack on the Police. Source | Thomas Nast, "The Day We Celebrate," wood engraving, Harper's Weekly, 6 April 1867. Cite This document | Thomas Nast, “The Day We Celebrate,” HERB: Resources for Teachers, accessed April 20, 2019, https://herb.ashp.cuny.edu/items/show/641.